To anyone who doesn’t know or has never considered that smartphones can be used as surveillance devices I offer the following screen shot. To explain, we have 2 elderly dogs who are having more and more “accidents” in the house that requires us to clean up. There have been discussions about this between my wife and I and there has been loud verbal grumbling but there has never been any online searches or keystrokes that relate to this issue. In other words, we’ve only talked about it. 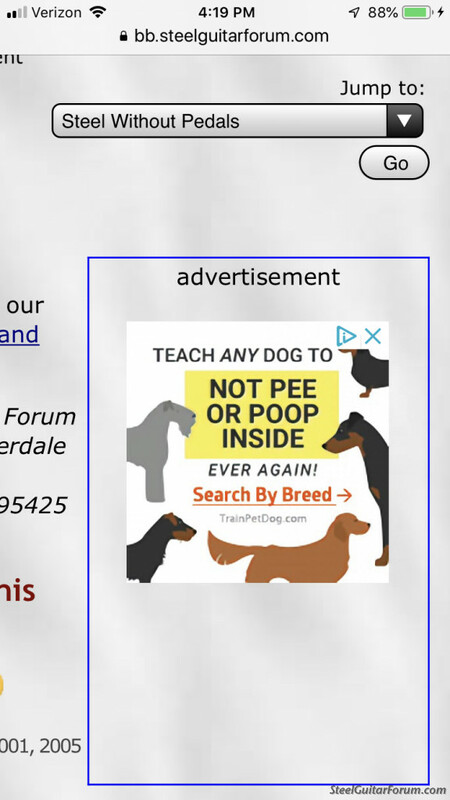 So a couple days back, I get the following ad on the forum. I want to be clear that I’m not being critical of b0b, I assume he has this site monetized in some way so he can eat. I just want to point out that everyone who owns and uses a smart phone is being at the least listened to. Anyone else have this type of “coincidence” happen? More likely an ad "dragged" in from your amazon order history (dog food, leash, pet stuff). Any pet owner might be interested in that service. Android phones are very limited if you don't have a Google account. Most people set up the Google account without understanding what that means. If you simply open and agree you pretty much give Google permission to monitor everything you do. Particularly intrusive, IMHO, is location and GPS tracking. If that is on, Google knows where you are every second of every day. It tracks where you do business and monetizes that data by pushing adds. If you turn off GPS and tracking permissions, things like maps and out of area roaming won't work. You can go to your Google account, see where your phone is in real time and, where it has been in the past. I am not paranoid about this, but I am concerned about how willingly we are trading our privacy for convenience. And yes, some apps have the ability to listen in. However apss generally ask permission before collecting your data. If you don't agree the app can't access your data, but they usually don't work either. The dog food add is a good example of how both service providers and app authors invade our lives with the promise of making our lives instantly manageable and infinitely convenient. Target was able to figure out if a woman was pregnant just based on what she bought at their stores, sometimes before the woman knew herself! They then tried to offer coupons for baby items, but this freaked out women because sometimes they didn't want anyone to know. So Target learned to mix the baby coupons in with other stuff so it wasn't so obvious. The point is, you may be giving someone data about your life in a whole bunch of different ways, and your online ads may just be a reflection of things you bought in the "real world." Also, your phone is probably not "listening," but the apps you use do have ways of collecting data, i.e. Maps tracks where you've been based on what locations you've searched for, etc. And odds are good you gave these apps permission when you clicked on the Terms & Conditions without reading them. Bottom line: Yup, they're paying attention. Brian, I think you said you had sold your Carter pedal steel, but maybe you were previously searching about broken "dog bone" rod pullers? Hey Bob, I suppose it’s just cookie harvest, but I don’t trust online businesses to follow terms of service. If breaking from the terms in the direction of further privacy invasion profits them and they can get away with it, I think they often do. I think I’m turning into a cynical, paranoid old fart! Brian, you were right...maybe somebody was actually listening in to your household conversations via this newly discovered Facetime bug! In light of this, I have removed the Google ad. I’m sure it’s just coincidence b0b, but ever since I made the original post, my Google ad box was always empty! I found that it was often very slow to load, which was another good reason to delete it. Plus, some of the ads were very misleading. Good riddance. One data mining technique, as mentioned, is to monitor all products you buy with a credit card. You may have bought some specialty product to clean pet stains, and that's where they got your info. Believe me, they are listening. While traveling with my 30' camper, I pulled in to a large parking area next to a McDonalds, went to the door, and only drive thru was open due to construction. After a few curse words while back in my truck, we got back on the hwy, Garmin said to exit 3 miles later, so thought it was traffic related, and got off, 2 blocks later it said turn in to shopping center, and you have arrived. Puzzled, I looked around, and there was a Mc D's. I just looked at my wife, and said that is scary. It's Android that is the basic culprit. It data mines everything you do, links all your friends and contacts and their friends and contacts and prompts you with upgrades, and requests for a peek into your files and folders. Gargle is not innocent as well. Using Gargle on a droid, may as well be in that Baldwin movie Silver or A Scanner Darkly with Keanu Reeves, Woody Harrelson, Robert Downey Jr. The front camera on your smart phone? Selfies? This is what Gargle is doing in China.